Hello! I didn't have time last night to get any photos ready for a swatch post for you guys, sorry! Instead you get this gradient dot manicure that was sitting in my drafts, waiting for an occasion such as this! I recently made a photo tutorial on this technique for the Julep blog, so if you're into photo tutorials, go check out the post there. If you prefer my graphic tutorials, great news! I've included one in this post for you, too! I know this design isn't very complicated, but I also know that I'm sure some of you would find it helpful to visually see how this is done. So let's get started! Start with a dry base color. 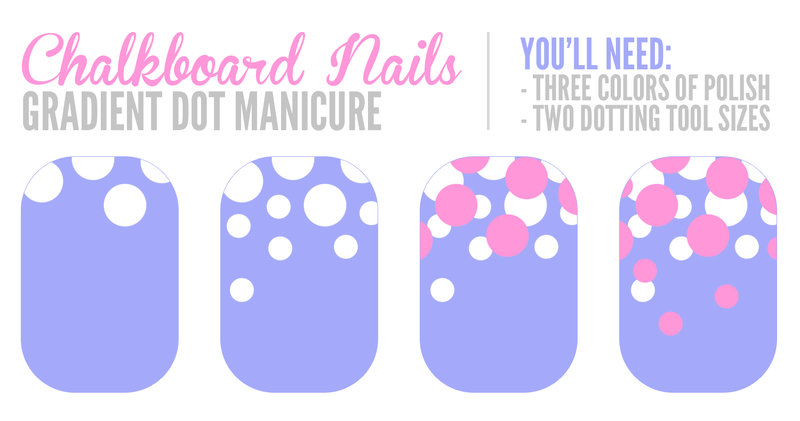 Using your first dot color and the large end of your dotting tool, add 3-5 large dots at the tip of your nail. Make sure some of them go off the edges of the nail. Flip your dotter over to the small end and add 4-6 small dots going down the nail. Concentrate them at the tip, and make them more spaced out as you move down the nail. Clean your dotting tool off and repeat step one with your second dot color. Make sure to fill in spaces between your first round of dots. Overlapping is encouraged! Repeat step two with your second color, filling in any spaces that look imbalanced or empty. For this particular version, I used China Glaze Secret Periwinkle as the base. The dots are done with OPI If You Moust You Moust and OPI My Boyfriend Scales Walls. Love it! I seriously need to buy a dotting tool! Amazing! And thank you for the picture tutorial! 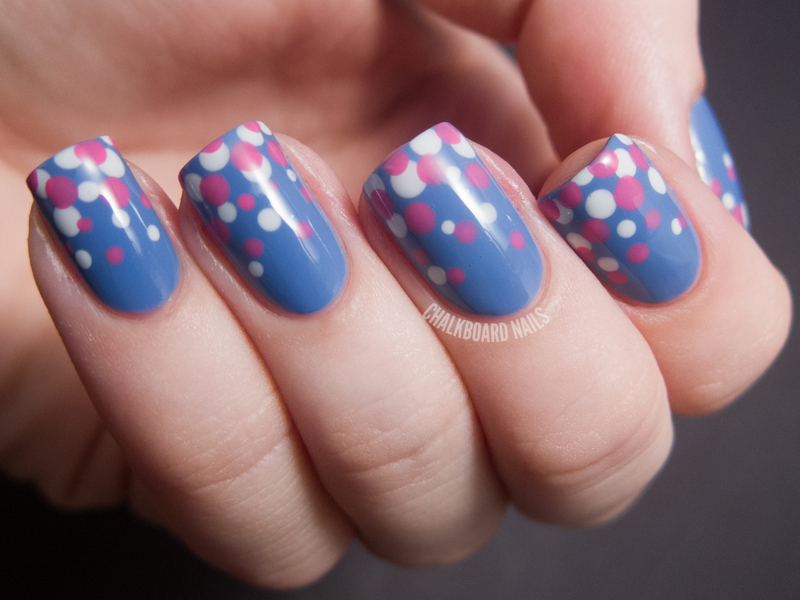 Gorgeous colours :) I love this gradient dot mani style. This is completely adorable! The color combo is fantastic! 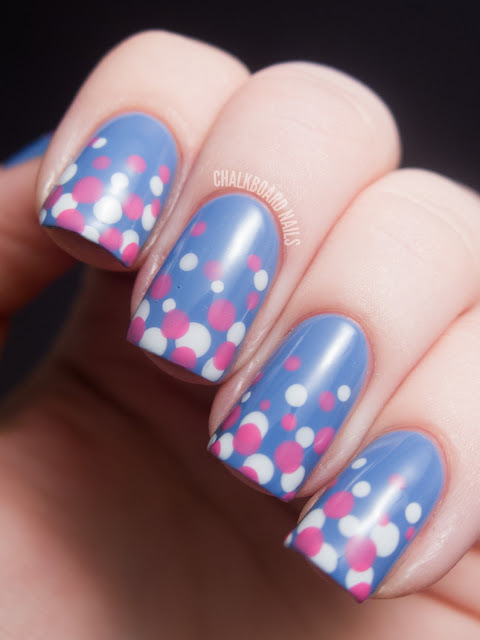 The dots look like little bubbles rising to the top of your nails. That is great! Love the tutorial! Your mermaid manicure inspired me to buy the MASH brush/tool set, and now I can't wait to get started dotting! Last time I tried gradient dots they looked awful! Thank you so much for the tips! I love this mani! It is so cheerful that it actually improves my mood to look at it. I appreciate the tutorial, too. I just got my dotting tools tonight from the craft store. They are designed for embossing, but look just like the nail art ones. Four for $8. So so so so so cute! I love that periwinkle blue! Looove!! Haha I recently did something a little like this but with different colours and coming from the cuticle!! I love dotting tools, such a lifesaver if you're in a rush but still want cute nails - they always turn out super adorable! Love these colours you used! I really want to try this, but I am scared I'll fail ;). Any tips for dots that lie flat? Mine just don't seem to settle/level, but your manicure almost looks like it's one coat of polish! I'd recommend getting a good glassy topcoat -- I use Seche Vite. This is such a cute design! I just used it for my 31 day challenge tutorial day with black, gray and white for Halloween! I just tried your great tutorial and it works!